The REDUCE MRSA Trial (Randomized Evaluation of Decolonization vs. Universal Clearance to Eliminate Methicillin-Resistant Staphylococcus aureus) found that universal decolonization was the most effective intervention to reduce MRSA infections. 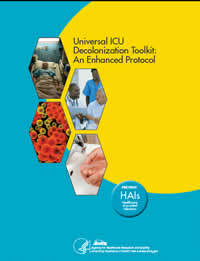 This enhanced protocol provides instructions for implementing universal decolonization in adult intensive care units. Preparation of this enhanced protocol was supported by the Agency for Healthcare Research and Quality (AHRQ) through contract HHSA290201000008i. The opinions presented herein are those of the authors and do not necessarily represent the position of the U.S. Department of Health and Human Services, AHRQ, or the Centers for Disease Control and Prevention (CDC). This protocol is in the public domain and may be reproduced and distributed without permission. Citation as to source is appreciated.